What does round ligament pain feel like? Most people describe round ligament pain as sharp, triggered by movement, and located deep within one or both sides of the lower abdomen or groin. Round ligament pain is a common pregnancy symptom, affecting between 10 and 30 percent of pregnant women. It can be uncomfortable but is harmless. Many women begin to experience it in the second trimester. In this article, learn more about what round ligament pain feels like and how to get relief. Round ligament pain occurs mostly in pregnant women. Round ligament pain is one of the most common pregnancy discomforts. The round ligaments are two ropelike cords of connective tissues that support the uterus on each side. These ligaments connect the uterus to the groin and pubic region. As the uterus grows during pregnancy, the round ligaments can stretch. When a pregnant woman moves, it can cause the round ligaments to spasm painfully. Round ligament pain is considered rare in women who are not pregnant, but may occur in those with endometriosis. Round ligament pain feels like a deep, sharp, stabbing or stretching sensation that begins or worsens with movement. Some triggering movements may include rolling over in bed or taking a step. The pain may travel upward or downward, from the hips into the groin. Pregnant women usually experience round ligament pain on the right side of the lower abdomen or pelvis. However, some experience it on their left side or both sides. Sudden movements, such as coughing, can trigger round ligament pain. When a person is not pregnant, the round ligaments that support the uterus are shorter and firm but flexible. During pregnancy, these ligaments lengthen, thicken, and stretch, much like a rubber band. In people who are not pregnant, the ligaments stretch and contract slowly. 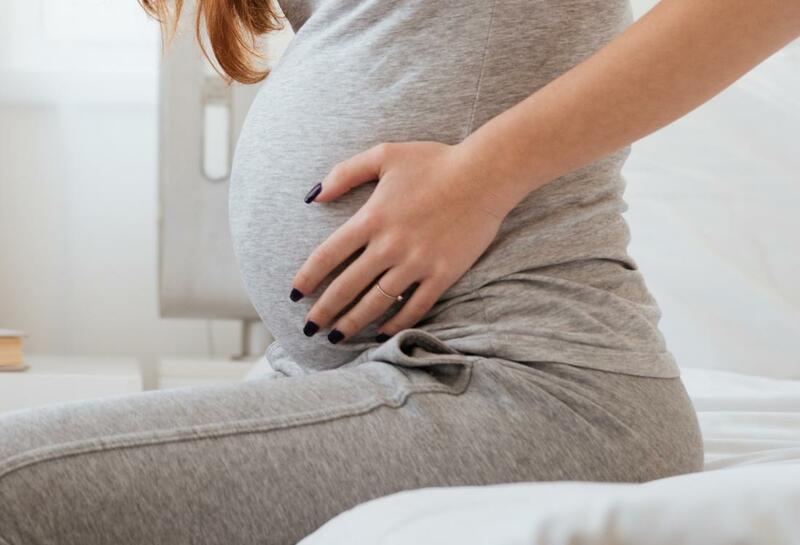 During pregnancy, they are under so much tension that they may stretch and contract rapidly, causing a ligament to spasm or pull on nerve endings. Most of the time, round ligament pain goes away on its own. However, people can take some steps to prevent it. Some people find that changing their daily routine to include more rest and fewer sudden movements helps alleviate round ligament pain. If a person experiences this pain frequently, they can speak to a doctor, who may recommend stretches and gentle exercises to help relieve discomfort. Round ligament pain should resolve completely after childbirth. Anyone experiencing severe or long-lasting abdominal pain should speak to a doctor. Most of the time, a person will not need to see a doctor for round ligament pain. However, sometimes pain in the lower abdomen and groin during pregnancy requires a doctor’s attention. These symptoms can indicate that the pelvic pain is unrelated to the round ligaments. During pregnancy, round ligament pain is a common complaint that often begins in the second trimester. Most of the time, the pain is sharp, short-lived, and located in the side of the lower abdomen or groin. Round ligament pain generally resolves on its own or after resting. A person can take steps to reduce round ligament pain, including moving slowly, resting, and wearing a support band. If severe pain in the lower abdomen does not resolve on its own or with rest, it is best to speak to a doctor.